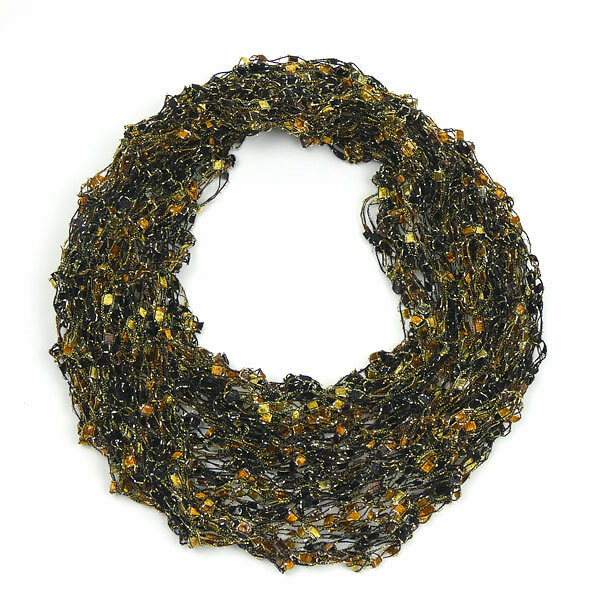 A very different necklace or neck decoration, this is one which is in a black and gold speciality yarn and was knitted by hand in Wales. The necklace is an interplay of black and gold coloured threads with small pieces of iridescent colour like small jewels, which include black, an orange and yellow gold, a touch of mauve and a grey. It has a thickness which gives a little touch of warmth - like a narrow snood. The necklace is stitched at the back and given a twist so that it lays well. It extends easily over the head, is easy to wear and ultra light.